Islam Around Us: Muslim Rebels Attack Another Philippine Town in Mindanao. Muslim Rebels Attack Another Philippine Town in Mindanao. 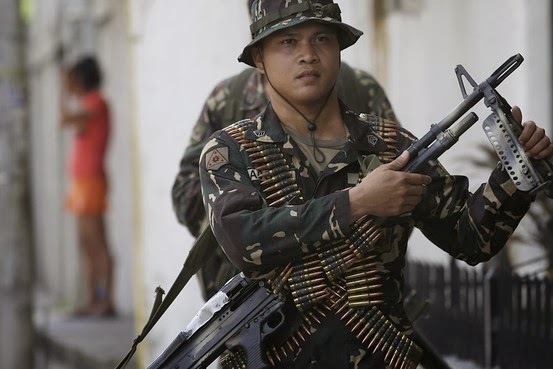 Philippine security forces on Monday battled a small splinter group of Muslim extremists in the southern region of Mindanao. Government troops patrol to secure the city streets on Sept.
21 in Zamboanga city in the southern Philippines. 23 Sep 2013 :: Philippine security forces on Monday battled a small splinter group of Muslim extremists in the southern region of Mindanao, raising concerns about the stability of the resource-rich region as an earlier hostage standoff in the commercial hub of Zamboanga City appeared to inch closer to an end. Rebels belonging to the Bangsamoro Islamic Freedom Fighters, a small group of militants that broke away from the larger Moro Islamic Liberation Front to protest peace talks with the government, attacked government volunteers in Midsayap town and took more than a dozen hostages after military troops arrived. Some of the hostages either escaped or were released. The Philippine government is now negotiating with the Islamic Front, the largest Muslim rebel group, to forge lasting peace in Mindanao, whose development has been stalled by decades of separatist conflict. In the other rebel fight, now in its third week, security forces are battling rebels from the Moro National Liberation Front faction of Nur Misuari in Zamboanga City, which is around 300 miles from Midsayap. That rebel faction, which had a peace deal with the government in 1996 and is against the current peace talks, attacked Zamboanga City on Sept. 9 to declare its independence from the Philippines. Zamboanga City is 1,160 miles south of Manila, on Mindanao island. The two rebel groups aren’t believed to be connected. The Bangsamoro Fighters had been planning Monday’s attack on Midsayap town for some time and took advantage of the standoff in Zamboaga City to launch their offensive,Army Capt. Antonio Bulao, spokesman of the 602nd infantry brigade based in North Cotabato, told The Wall Street Journal. “Authorities and residents have prepared for this attack,” Capt. Bulao said. The attackers failed to reach the town hall, the captain said, and were confined to villages in marshlands of the town in North Cotabato, a province 283 miles west of Zamboanga City, where several people have been “trapped” by the encounter and being used human shield by the rebels to protect their escape. Capt. Bulao said three soldiers and two Bangsamoro Figthers were killed in the early morning attack. He said negotiations are ongoing for the release of the seven hostages. In Zamboanga City, Lt. Col. Ramon Zagala, a spokesman for the Armed Forces of the Philippines, said sporadic gun battles continued Monday. He said, however, that the skirmishes aren’t as frequent, likely an indication that the National Front rebels still holed out in two villages are running low on ammunition. He said government forces continue to clear houses and other structures of rebels and unexploded munitions. Lt. Col. Zagala said around 105 rebels have been killed since the fighting erupted, while 176 hostages have been freed. The military estimates there are still 40 rebels holding out in the two villages and that they are holding around 20 hostages. The standoff in Zamboanga City has forced more than 100,000 residents from their homes.